How are digital technologies influencing geospatial technology trends? Definitions can be tricky, especially, in the geospatial world where technology merges with location data to empower the processes. Most applications and technologies today use location data for some purpose or the other. Self-driving cars, UAVs, Wearables, Augmented Reality, Internet of Things – all use spatial data and maps for a wide variety of purposes and applications. Is Canada prepared for severe weather events? Record-breaking cold temperatures across Canada this past winter; relentless forest fires in British Columbia last year, and in northern Alberta in 2016; devastating floods in Calgary and reckless flash floods in Toronto in 2013 – such extreme weather events are becoming more common and intense. Experts say Canadians aren’t prepared despite the increasing threat and rising costs of severe weather events.Municipalities, as well as organizations such as insurance companies and real estate builders, need to start using risk-mapping programs to create more awareness about flood-prone areas and better preparedness for disaster response. Natural Resources Canada (NRCan) has crafted an environment for encouraging government, businesses, citizens and development organizations to make optimum use of geospatial information in their respective functions and responsibilities. NRCan has been practicing conducive and enabling policy mechanisms and developing an open and accessible spatial data infrastructure. Watch this video that shows the work of NRCan and how it is playing a leading role in the development of Canada. The imagery and vector tile basemaps on ArcGIS Online were updated in February with more Canadian content. Vector tile basemaps are faster to create and draw than raster basemaps. There are now 18 Canadian contributors who have their data included in the current vector tile basemaps, including the federal government and two provinces. More contributors are being added each month. Over the first two months of 2018, the Community Map Program has updated the World Imagery Basemap with many high-resolution aerial imagery contributions. Updates include imagery from nine Canadian regions: Cochrane, AB (7 cm), Waterloo, ON (12 cm), Cambridge, ON (12 cm), Brampton, ON (10 cm), Kitchener, ON (12 cm), Coquitlam, BC (10 cm), Canmore, AB (7 cm), Halton Region, ON (10 cm) and Huron County, ON (20 cm). Emerging Technologies and Methods in Earth Observation for Agricultural Monitoring (EOFSAC) is a joint workshop sponsored by Agriculture and Agri-Food Canada (AAFC) and others. In this three-day event held in February 2018 at USDA National Agricultural Library in Beltsville Maryland, several AAFC staff gave presentations on identifying gaps and challenges for the operational user community and results from the research community relevant to operational agricultural monitoring using Earth Observation (EO). The commercial world has undergone a revolution in its awareness of the importance of geospatial information in the past decade. Businesses and governments now routinely include location information in their analysis of many sorts of problems and the planning of their operations. The Larose Forest near Ottawa was initiated in 1928 when agronomist, Ferdinand Larose, undertook a conifer plantation on lands that were abandoned due to soil erosion. Today, the Larose Forest is owned and managed by local governments. More than 18 million trees have been planted making it the second largest community forest in Ontario. A contemporary web map has been produced to show the unique nature of the forest. New data debunks several myths about which companies lead in open source contributions. Esri ranks number 24 on the global list of companies contributing to open source. Using the metrics of any company’s total number of employees actively contributing to open source projects, check out how GitHub ranks these companies by pulling the public profiles of its 2,060,011 unique users. 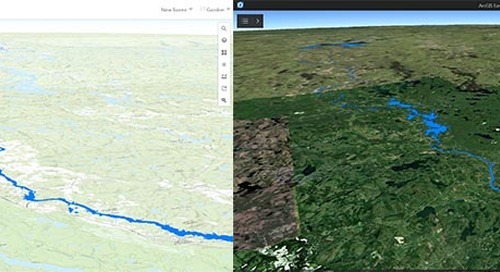 The ArcGIS platform connects maps, apps, data and people in ways that help organizations make more informed and faster decisions, extending the reach of GIS across the enterprise. ArcGIS makes it easy for everyone in an organization to discover, use, make and share maps from any device, anywhere, anytime. 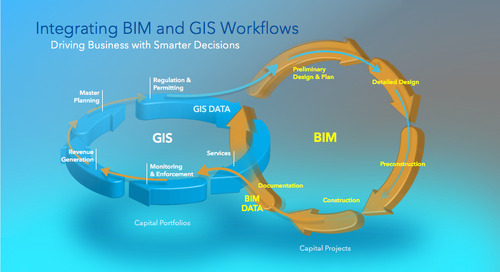 Maximize the value of the ArcGIS platform through the application of guidelines presented in these best practices and implementation approaches. Esri Developer Summit is designed to show how to build cutting-edge apps using advanced mapping technology from Esri. The four-day conference is packed with sessions with experts who discuss best practices for development patterns, problem-solving, deployment challenges, and platform integration. This year’s Esri DevSummit 2018 was held in March at Palm Springs in California. The videos from different sessions are now available online. Is 3D web ready for mainstream applications?